Holly Solomon, 28, really really does not like President Barack Obama. 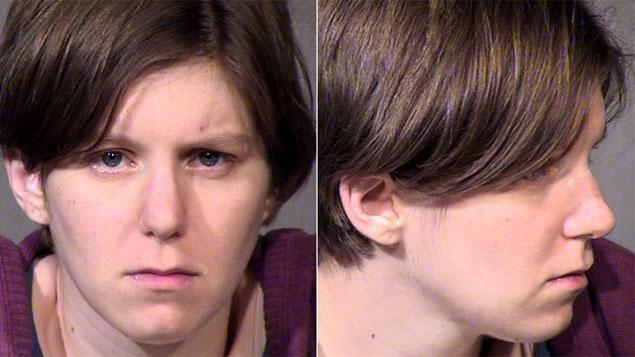 The six-month pregnant Arizona woman was arrested for allegedly running over her husband with her SUV after learning that he did not take the time to vote for Romney last week. She believed a second term would be a disaster for her family and she appears to be right: she is now facing charges of domestic violence and aggravated assault. Daniel Solomon apparently tried to escape by ducking behind a light post and then making a run for it. However, his wife — and their SUV — made quick work of that. She has a great defense: she was just trying to scare him but failed to hit the brake in time. She will likely have to explain later — he remains in critical condition. This could be an interesting voir dire. Do the attorneys strike Obama and Romney supporters respectively? That would leave a jury of Jill Stein supporters, which would likely find the most disturbing element to be the continued use of a gas-guzzling SUV. I don’t drink often or much, but if you’re in the gift giving mood, Monopolova is a very reasonable very good potato vodka. At less than $20 a liter, I’m a bargain on your list compared to those high maintenance scotch drinkers. There are a lot of folks that act “so called Normal” that are really psychotic…. You pass them probably every day…. Just because they have some functioning social skills they have not yet been declared legally insane….. It’s just a matter of time before dementia or alzimers sets in then they are locked up for there own protection……I’ve seen it happen quite often…. Especially if you’ve ever done any elder law…..
OK, she’s nuts, she’s dangerous, she’s about to reproduce, and half of that part of it (probably) is her husband’s fault. But he didn’t deserve to get run over. Also, bad haircut. ARIZONA? Something’s wrong with the air out there. And one to send to your good friend, Blouise. I know. Unfortunately, I was outbid on that Lalique decanter of 64-year-old The Macallan. However, Christmas is coming and they do have some 55-year-old in Lalique decanters for only $19,000 per bottle. I need two. One for the living room and one for the dining room. Romney blames his loss on big “gifts” that Obama gave African Americans, Hispanics, & young voters. It is true, the cows do come home. Arizona, today, still counting 300,000 votes & hoping the citizens get bored and lose interest. Bron, if you are ordering The Macallan, please send driving directions to your house. Gives new meaning to Voter Compression Suppression. I voted on the 18th. Early but not often. I voted a straight ticket. Not one of them was gay. Then I learned that some guy on the Democratic Ticket would not put the word Democrat on his yard signs. He did not want anyone to think that he was for Obama–the guy at the head of this ticket. So I wanted to withdraw my vote for this guy and I went to the Board of Elections. They said that I could not change my vote. But I pointed out that the polls were not closed. So I walked out to the line of waiting voters and told the story. About twenty of them said they would not vote for this two faced skunk. He ended up losing the election. Thank dog. only single malt. I am buying a couple of cases of scotch and cigars while I still have money. That was DAMN good scotch! At least it should have been. I went to the doctor on the 9th, they told me ODS isnt covered by my policy. So I had to spend $150 on a bottle of good scotch instead. After drinking it over the weekend, I felt much better. And since most of the people here seem to be pretty decent people, I didnt have a bad case anyway.